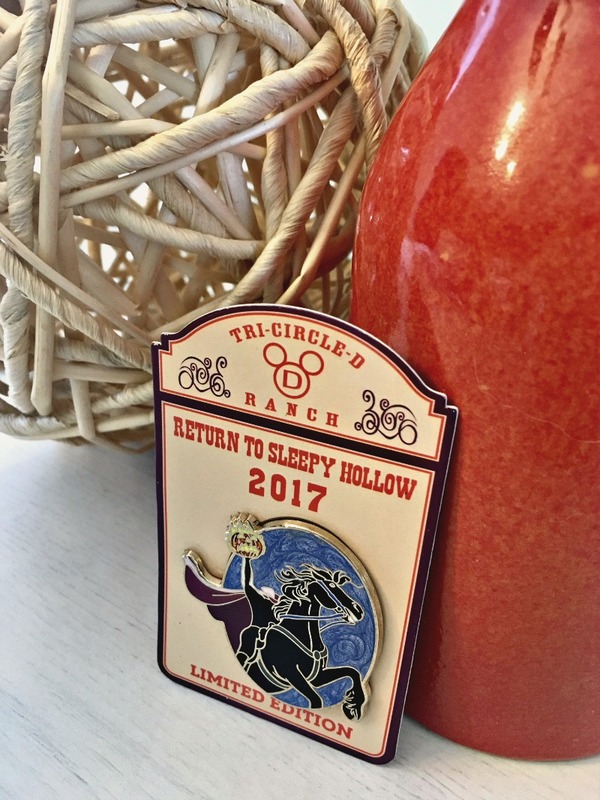 As soon as I heard that the inaugural Return to Sleepy Hollow Event at the Walt Disney World Fort Wilderness Resort & Campground was happening during my vacation, I knew I had to attend. And then when I heard this event was returning in 2018, I knew I had to tell you all about it! I bought a ticket in 2017 right away and hoped some friends would join me, but I knew I would go anyway. 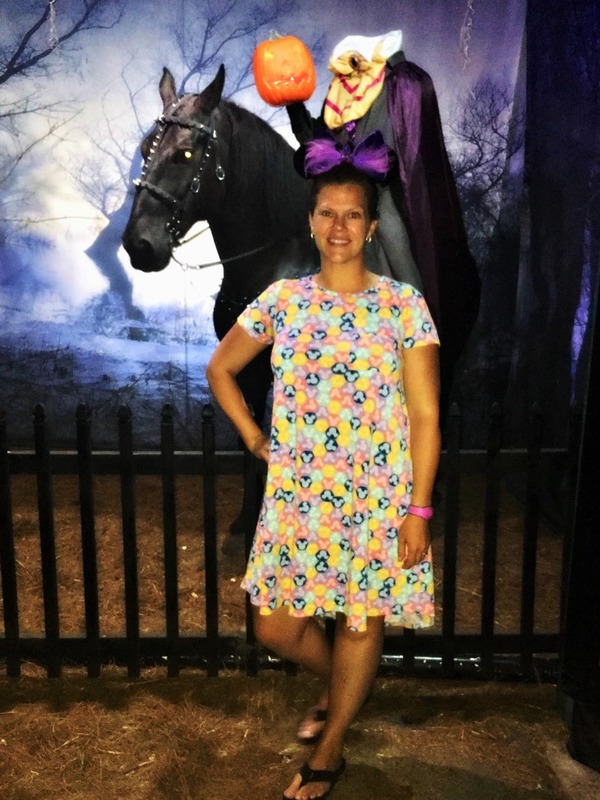 I mean, how do you pass up the chance to have a photo op with the Headless Horseman?! Answer: you don’t. Thankfully, my friend Ashley also planned to be there and we had a fantastic time! I love all things Disney Halloween and this event was no different. Located inside the Tri-Circle-D Ranch stables at Disney’s Fort Wilderness Resort & Campground, the scene is set for a spooktacular evening. Seats are set up right down the middle of the stables and you can even hear the live horses milling about in their stalls. 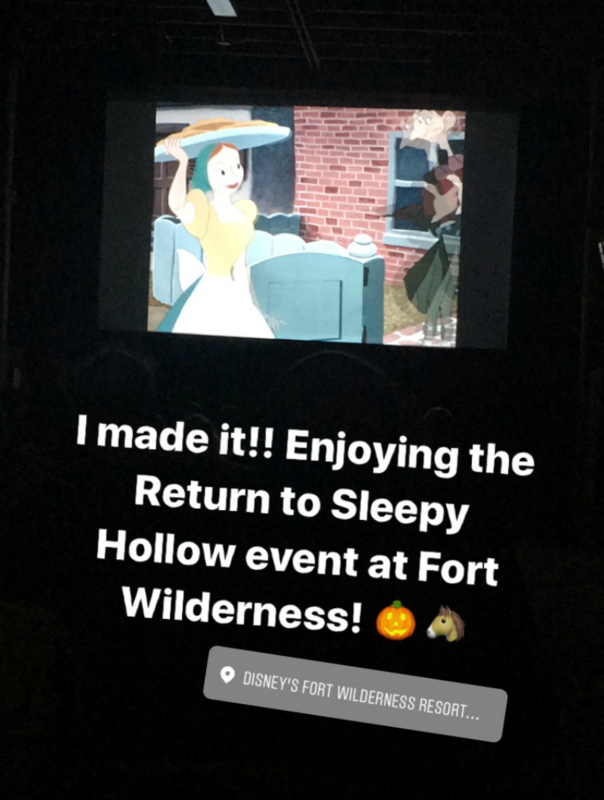 After you check-in and find a seat, sit back and enjoy a the viewing of the 1949 Disney animated “The Legend of Sleepy Hollow” movie. It had been so long since I’d seen this little movie, I’d forgotten how good it is! We were given a bag of popcorn and a limited edition pin before being seated. I knew I would get the pin, but the popcorn was a welcome surprise! NOTE: I’m not sure if they will offer pins this year. As soon as I know I will update here. Once the movie is over, thunder starts as the screen lifts and the Headless Horseman is revealed. I actually filmed that part so if you want to watch it beforehand, take a look. Or skip it if you want to preserve the mystery! 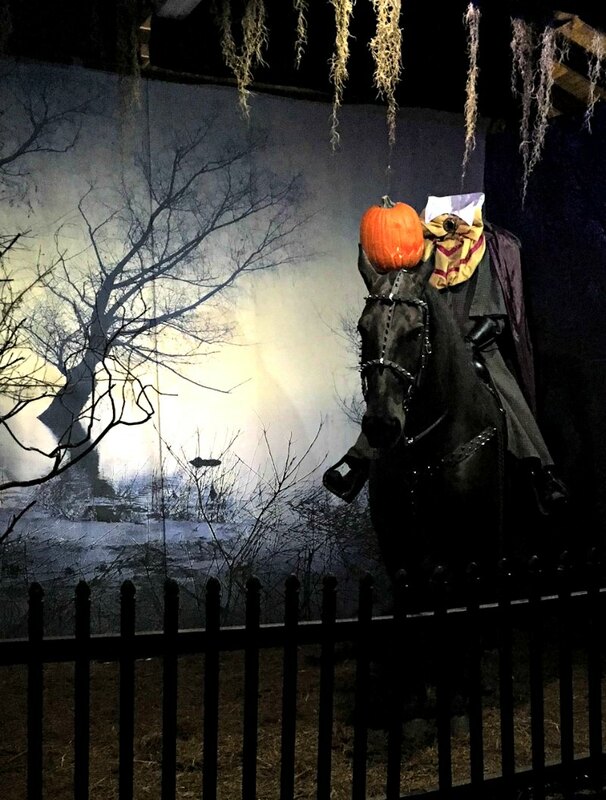 If you have ever been to Mickey’s Not-So-Scary Halloween Party, you’ve likely seen the Headless Horseman ride down Main Street, U.S.A. before the parade. It’s so fun to wonder just how they make that magic happen and until now, catching a pick as he trots by is the best one could hope for. I loved seeing him up close and getting an official PhotoPass picture! Priority seats get to go first, but the line moved quickly enough that I didn’t mind waiting for my turn. According to the Disney Parks Blog, this year’s dates include September 28-30, October 3-7, October 10-14, 17-21, 24-31 with times at both 8 and 10 p.m.
New in 2018 – There will be a dessert party at 9 p.m. between the two showtimes for an additional cost. To book either showing and photo op and/or the dessert party, call 407-WDW-TOUR. 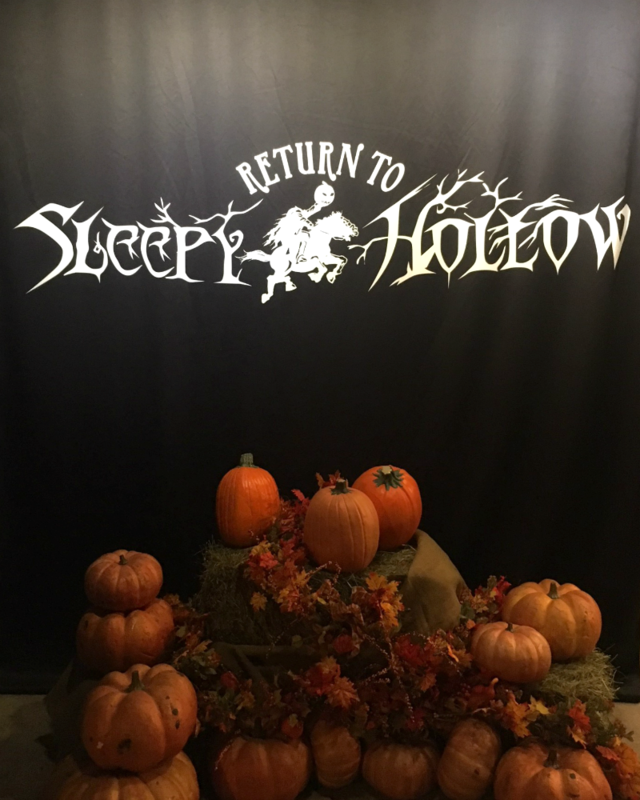 General seating (seats middle to back and photo op) costs $22 per person, while premium seating (seats closer to the front, priority photo op with the Headless Horseman and a Halloween treat bag) costs $38 per person. The dessert party at 9 p.m. costs $60 per person. If you plan to go, I recommend booking asap. This is not a large event and while I don’t have exact numbers, my guess is there is seating for maybe around 100-150 people max per show. If you do the math, these will go fast! When you call, make sure to check the cancellation policy to be sure you can change your plans if needed. And if you decide not to bring the kiddos, check out the Pixar Play Zone kids’ club just across the water at Disney’s Contemporary Resort. You’ll definitely want to allow extra travel time to get to the Tri-Circle-D Ranch stables. You can drive, take the bus or even a boat to Fort Wilderness. But once you are there, you will need to take an internal bus (if driving or using Disney busses, or Uber/Minnie Van services) to get to the stables. If you take the boat, allow at least 10 minutes to walk from the dock to the stables. I took the boat over from Magic Kingdom and didn’t account for that walk. Thankfully, a VERY understanding Cast Member saw the pained look on my face and offered me a ride in his golf cart getting me there JUST as the movie started! Yay for Disney magic. And now I know better! Once you are there, relax and enjoy your spooktacular evening! I TOTALLY NEED TO DO THIS WITH THE KIDS, THEY’D LOVE IT! It is seriously so much fun!